The Bing No. 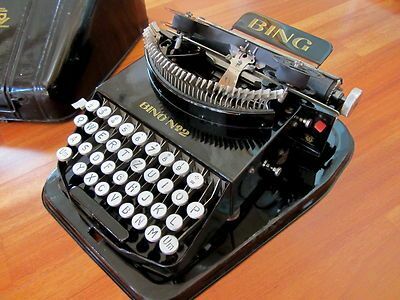 1, simply called Bing, was introduced in 1925 and sold for $11.95.2 Copy from one advertisement reads, “Built like a real one. Children learn to spell correctly and compose letters. The best educational toy” (see image below). It appears the No. 1 was offered in black only.3 It employed an ink pad system for type impressions. English and German versions of this machine are extant. 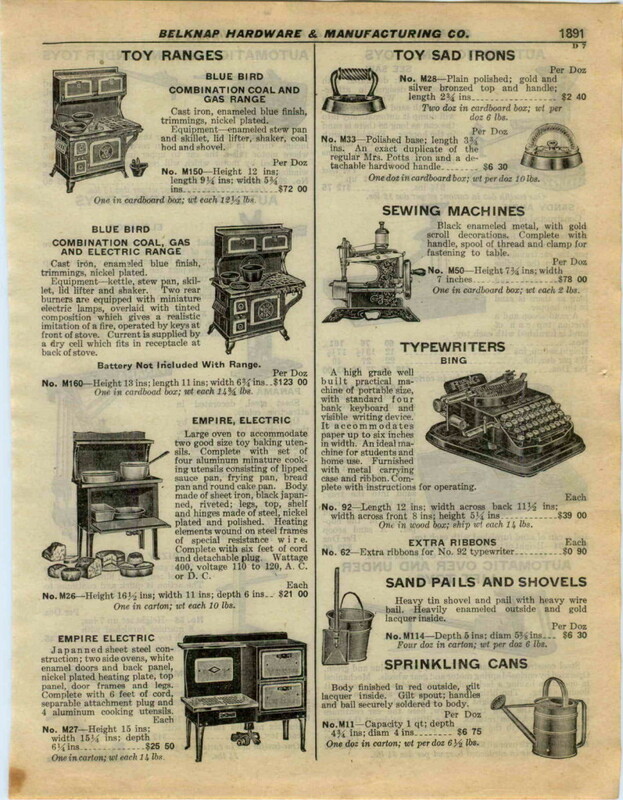 Also see page 28 of Darryl Rehr’s Antique Typewriters & Office Collectibles. A variant of the No. 1 employs a ribbon system, and is known to collectors as the 1B or 1 1/2. 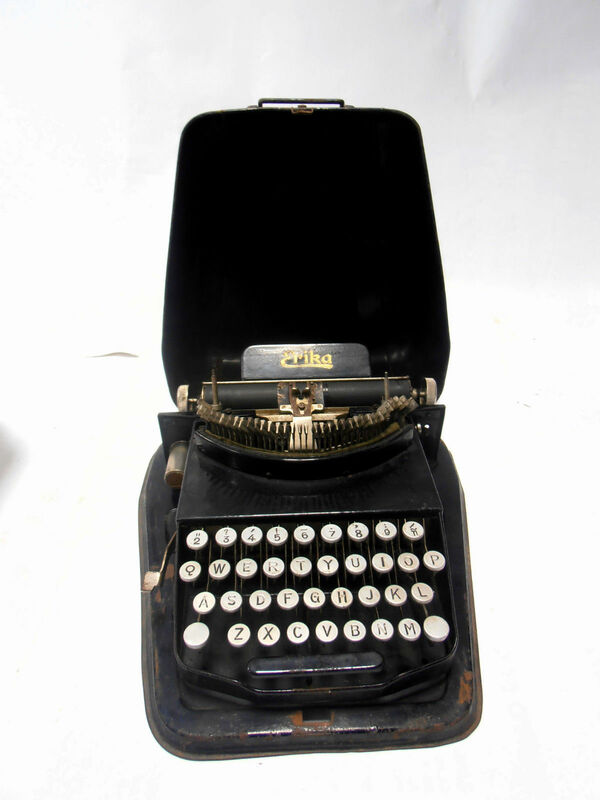 An example can be seen here at Chuck’s Antique Typewriter Website and Museum — note the wire paper table. Upon close inspection, however, one observes that the 1 1/2 more closely resembles the No. 2 (note the lever on the left side — this is lacking on the No. 1, but present on the No. 2). The 1B may simply be a No. 2 with older decals. Side-by-side comparison of No. 1 and No. 2. Principal differences are the inking system and that the No. 1 lacks an external shift-lock lever. The 1B has the wire paper table, but also ribbon spools and external lever. Is the 1B more a 1 or a 2? The Bing No. 2, offered in black or ivory, was introduced in 1927 and sold for around $39. 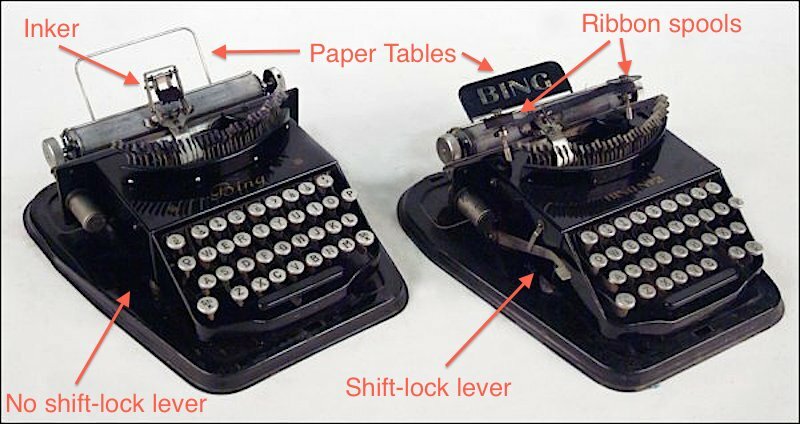 The words “Bing,” “Student” or “Bing Student Type” appear on the paper table. This model employed a standard inking system and a shift-lock lever, positioned outside the housing (left side of the machine). The No. 2 included a manual apparently. German keyboard, but English model name: “No. 2”. 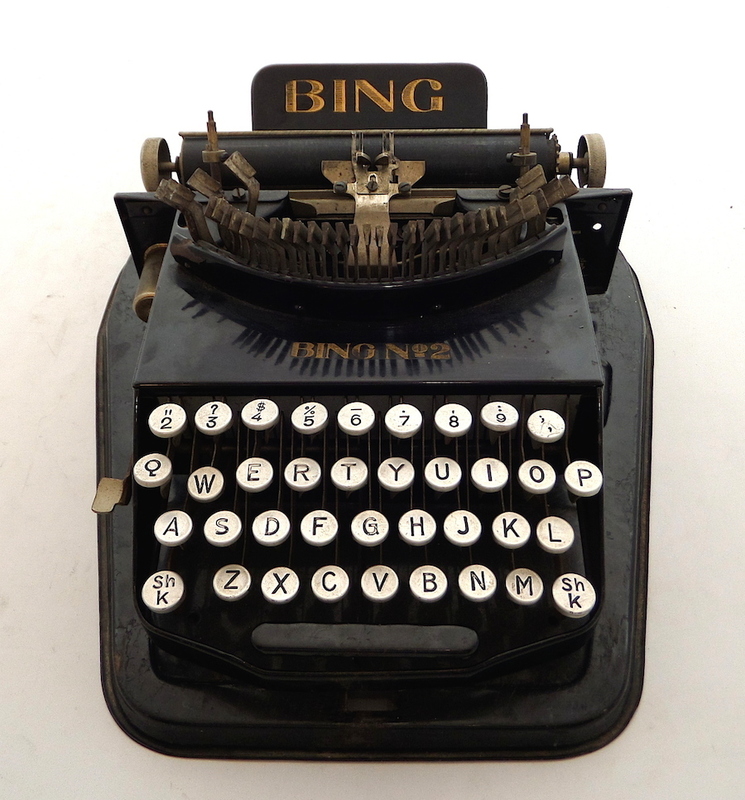 An unmarked Bing Student Type with wood base and aluminum keys (unlike its English counterpart). Cover is likewise unmarked (click here to view). 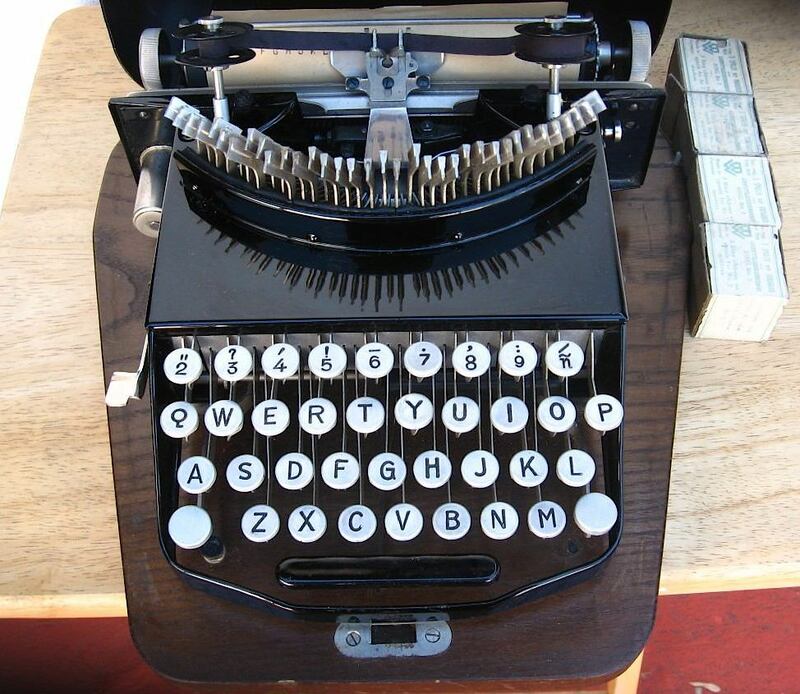 Again, see page 28 of Darryl Rehr’s Antique Typewriters & Office Collectibles. Both the Bing No. 1 and No. 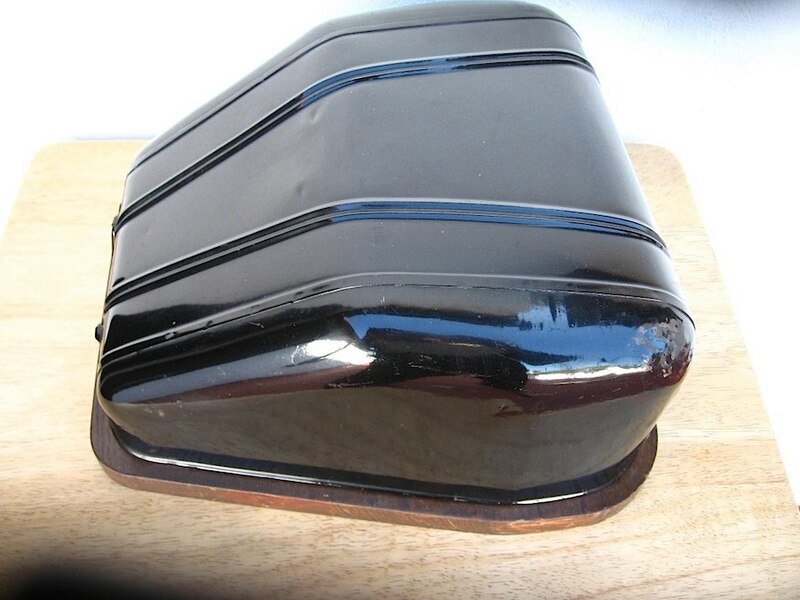 2 included a metal/tin cover. Some No. 2s — e.g. 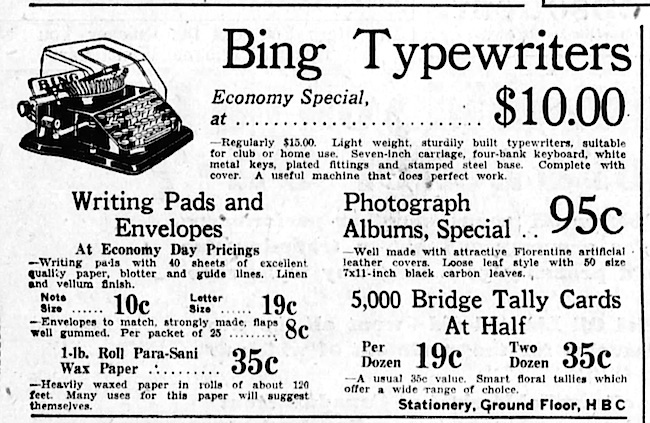 the “Bing Student Type” — came with a wooden base (see here). None have serial numbers. A few ivory Bings are unmarked on the exterior and interior. 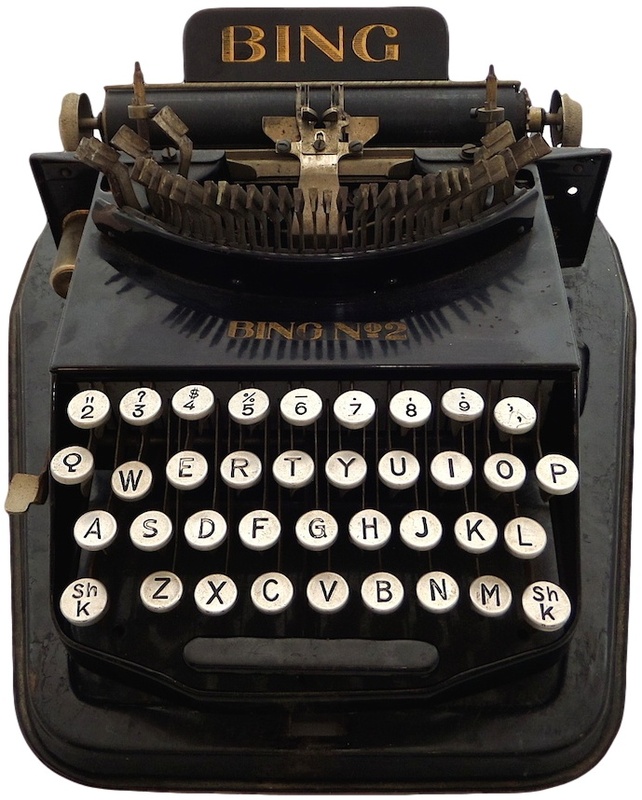 As for name variants, TypewriterDatabase lists Amka, Beko,5 and Berni; the Chestnut Ridge Typewriter Museum lists two: Berni, which it describes as “very rare,” and Anfoe Student, which is white with metal rimmed keys. The Anfoe with QWERTY keyboard. 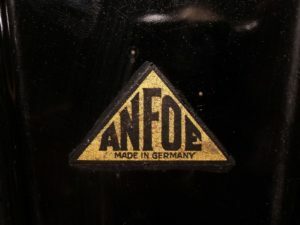 Anfoe logo on metal cover. 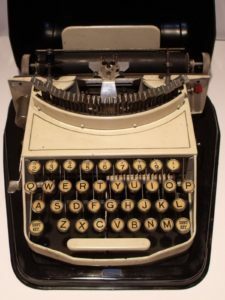 The 1924 Typewriter Topics historical compendium notes that Bing-Werke AG of Nurnberg, Germany entered the field of standard typewriter manufacturing in 1922 with a fully competitive four bank machine featuring a removable carriage, single shift and 44 keys known as the ORGA. 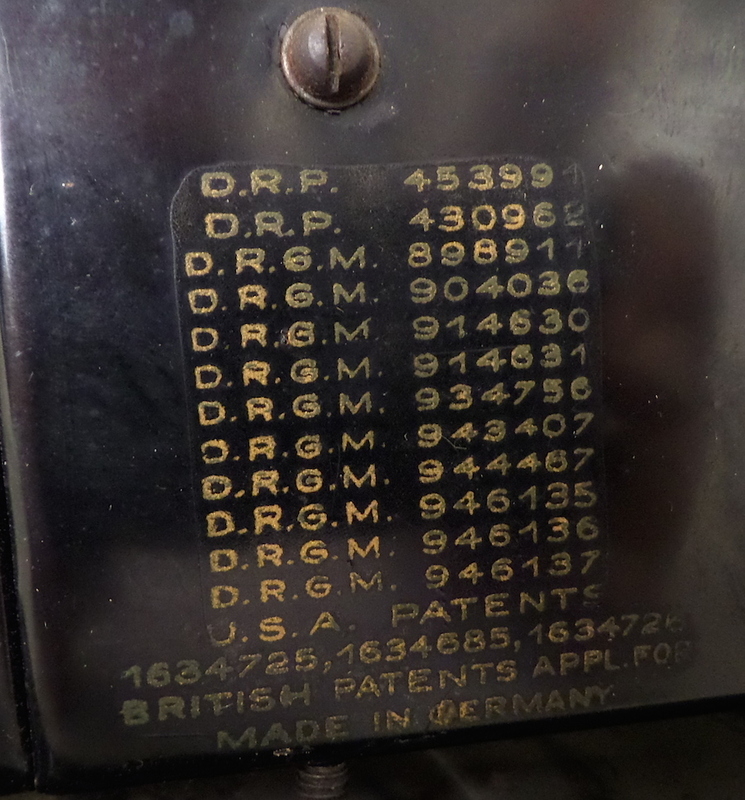 Today’s research shows a number of patents ascribed to Ludwig Reischl which were assigned to Bing-Werke, applicable to this machine. After a short time, Bing-Werke additionally developed and released a highly stripped version of its typewriter to appeal to those requiring a sturdy machine at a markedly lower price; this machine was the ORGA Privat. A German-language website claims ORGA purchased the toy factory “Bing-Werke front. Gebr. Bing AG” in 1924,6 but Davis describes that Bing-Werke created ORGA. The distinction is slight, but significant. 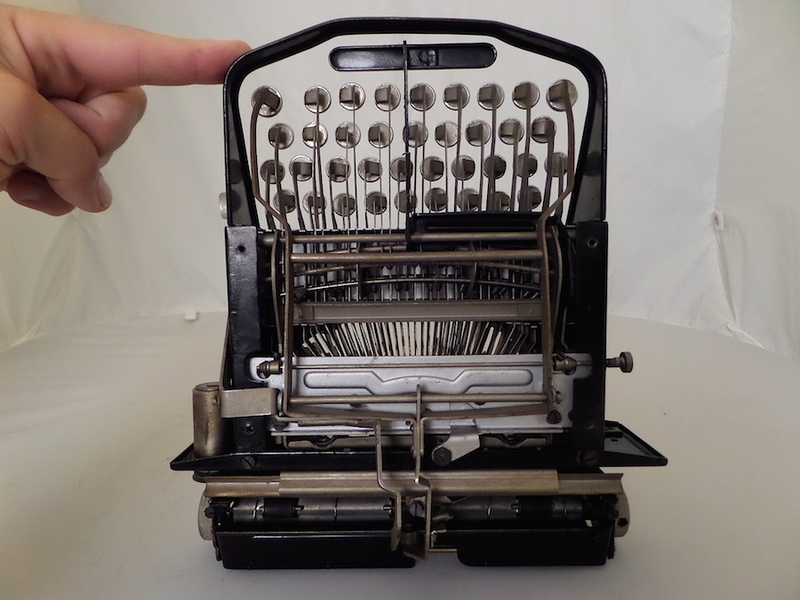 Update: Robert Messenger offers more historical insights — inventor and patent information — at oz.Typewriter (see here). Text only, but this advertisement likely describes the Bing No. 1. From the Reading Times (Reading, Pennsylvania), Dec 21, 1925. From a 1927 catalog for Belknap Hardware & Manufacturing Co.
From The Winnipeg Tribune (Winnipeg, Manitoba, Canada), Mar 27, 1929. © 2014 – 2017, Mark Adams. All rights reserved. Slightly revised (Sept. 2). I corrected a few links, and included a description of the 1B, the transitional model — to me, however, it looks like the No. 2 with old decals. Yikes, yet another revision. Added: German-language No. 1, images of the “Bing Student Type” and some clarifications. Yikes! It’s become a live document. Thanks. Embedded Flickr image in post. Great machine. I wonder why they occasionally sold this machine sans markings, though I note “Made in Germany” on one of the images in your set. 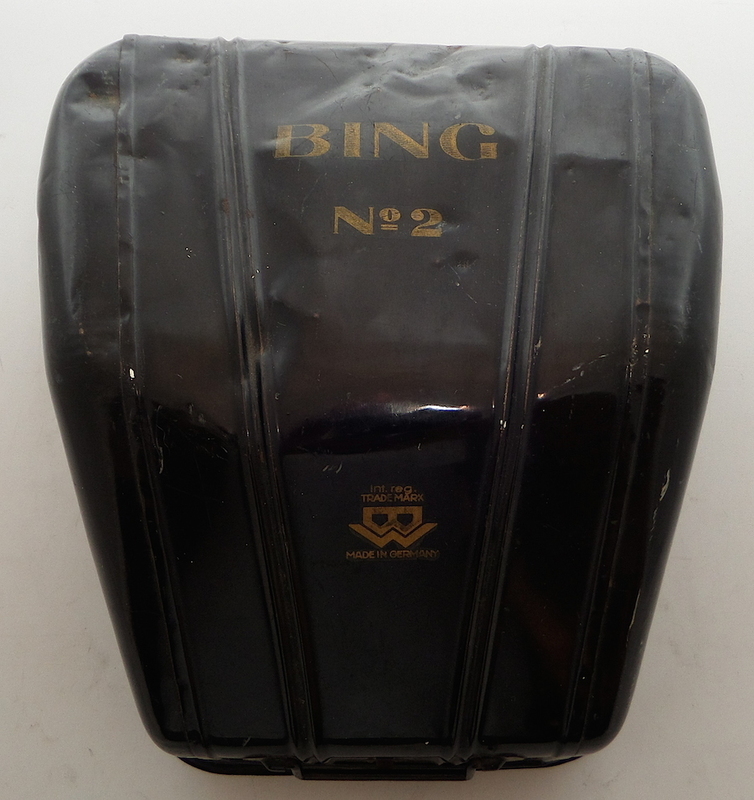 I bought a ‘Bing No 2″ off ebay. I have sold a lot of my vintage typewriters, but I keep three. Now add the Bing, it’s four. I display them in my home office on my large book case.